Baseballiana. Baseballically. Baseballistic. Baseballese. BASEBALL. It’s adorable. Now, starting with how adorable it is may lead some people to believe that I’m only in it for the cute, which wouldn’t bother me all that much, really. If you thought I only liked baseball because it’s cute that’s all right because its cuteness really is enough for me. And because I am a woman a lot of men look at me like I’m a glittery pink unicorn when I talk about sports. Yes! I know about sports and don’t always feel the need to prove it, but yes I can also prove it. I don’t need sports mansplained to me in any way. No, wait. I take that back. Any men who play professionally … I would probably let them mansplain some stuff to me but they would have to be VERY cute—so I talked in a circle, my bad. And whoops deal with it. Tina Belcher, preach and keep on preaching. What I’m saying is please believe and know that I am a fan of the game, most importantly, even more than I am a fan of the players/teams. Baseball, itself, is enough for me. I will also tell you that I can explain defensive indifference and the infield fly rule and the difference between an earned and an unearned run. I love box scores and reading about sabermetrics. 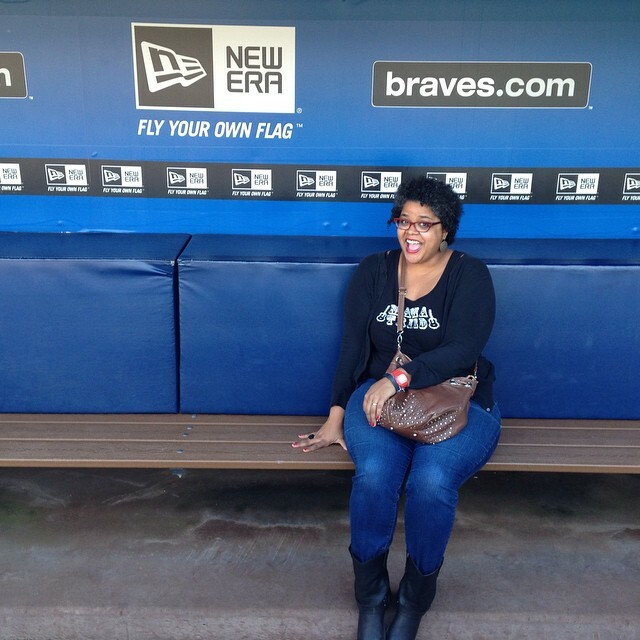 In the fall I went on a tour of Turner Field and there was only one other family on the tour and being there, in the locker room, at the ballpark with it so quiet and empty, in the dugout, in the press room and way down below where they keep stacks and stacks of boxes of sunflower seeds was the happiest and warmest and best of everything. I still think about it everyday because it was my favorite, favorite. Just being at the park. I don’t care who’s playing. I don’t care what day it is. I don’t care what the weather is. Baseball saves me. This past summer I was watching a Rays-Angels game and the power at Tropicana Field went out for a bit. 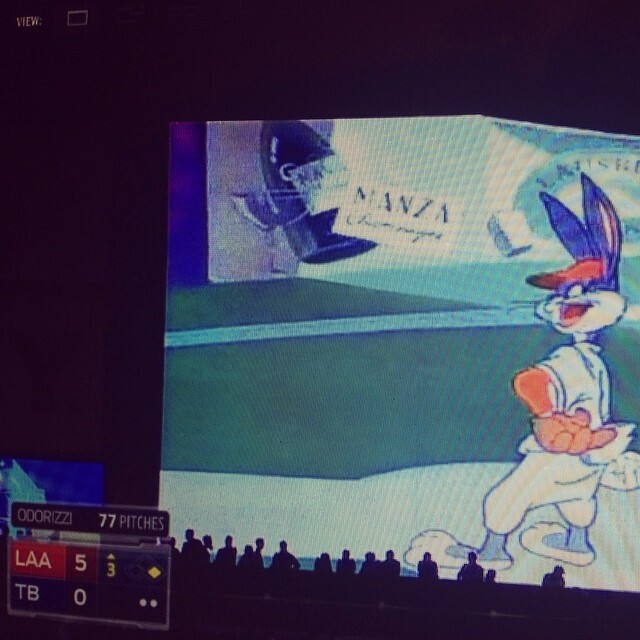 The good people at the Trop put a Bugs Bunny baseball cartoon up on the big screen. It was all kinds of adorable. The baseball boys, the fans, everyone kind of hanging out and snacking, watching Looney Tunes for like, 19 minutes while the magical light-fixing people got the lights to come back on. My point is that baseball is very cute. So adorable. The little dugout snacks, the candy, the popsicles when it’s so summer-hot. I love the dugout cameras so I can see what the players are doing everylittlemoment. Look at them blowing big pink bubbles and their adorable handshakes and conversations and sunflower seeds! Beginning with Spring Training and going until the last game of the World Series (minus the All-Star Break of gloomy emptiness and deep sadness), I watch baseball everyday. It is one of the great loves of my life. There are games prettymuch everyday during the regular season and unless something huge comes up, I’m watching at least one live game a day and if I can’t watch with my eyes I’m watching with my ears, listening to the radio feeds as I do carpool/errands/life. I also have MLB.TV so I can go back and watch the ones I miss. I love baseball for a lot of reasons that I have stored in the sweetest places in my heart, nice little organized stacks and big bowls of tiny littles I could never put into words, good and proper—like the tang of the first bite of hot dog and mustard and Sunday afternoons after church at the ballpark (church, then church). The specific snapping sound the catcher’s mitt makes during pitching warm-ups on a spring Saturday and how that sound is made better when I’m on the way to the concession stand for my second beer (I usually have one but also sometimes I like having exactly two.) Or how the ballplayers come over and clap clap clap clap so we all get hyphy. Or how we go to the college ballpark by the train tracks and the train whistle blows randomly and it’s near the airport, so also planes and my children next to me, reading things or keeping score or fighting about popcorn. There are games in between innings! Little races and trivia on the big screen! All of it. It’s bigger than the game itself, but it is still the game. And in this game, there is cuteness. I’m not just talking about baseball butts, which are very cute. The cutest. (Baseball and soccer are my personal choice of cutest sports butts followed closely by football.) I’m talking about baseball terms and the cuteness therein. 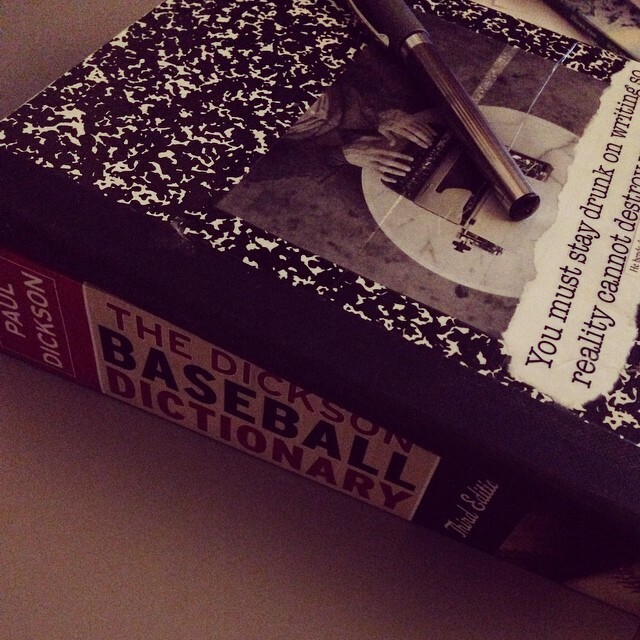 I have been reading through the behemoth of The Dickson Baseball Dictionary Third Edition (2009) which is described as “The Revised, Expanded, and Now-Definitive Work on the Language of Baseball.” I keep it next to my bed. Baseball comforts me. I keep a copy of the Bible next to my bed too, for the same reasons. The nicknames for the baseball itself? Adorable. Look: egg, nugget, pearl, radish, apple, apricot! Seriously. RADISH. Radish is such an adorable word. And there are so many cute food terms in baseball! Pickle, popcorn, can of corn (an easily caught fly ball), high/easy cheese (fastball), jam sandwich, jellybean (rookie), lollipop, long potato, meatball, mustard (fastball), onion picker, pretzel (curveball), saucepan (home plate), snow cone, rhubarb, tater, hot stove. The outfield is sometimes called the garden, the infield, the inner garden. And there’s the Linda Ronstadt because she sings “Blue Bayou” and that’s what a fastball does too—blew by you. And it’s a Michael Jackson if it’s Off The Wall. Rookies have been called gazoonies, earnie is short for earned run, grannies are grand slams, screwgies are screwballs. Hipper-dipper and hitchy-koo. Jackrabbit ball, southpaw, whangdoodle. There’s also something called SUNFLOWER SEED FINGER when the player gets an owie from going into his pocket over and over again for seeds. I have lots to say about why baseball is my favorite, favorite and I’ll write about those things here a LOT so you’re very welcome orrrr all apologies, except not really because I’m in love I’m love and I don’t care who knows it. I am, I am indeed—overwhelmed by the baseball-cute sometimes. In the best way. From butts to bunts. Small ball! Baseball, you are forever adorable and I love you, lover. Come over here and lemme kiss your face.